I thought that the last week was summed up very well by the three A's - Auch, Albi and Airbus! James had his first airbus A320 delivery starting last Tuesday. A team from Air NZ came over to help James. Normally delivery week involves four full on days and then the plane leaves on the following Saturday. This time was to be a bit different though as Air NZ is the launch customer for the A320's with sharklets and it was due to head to the Paris air show. 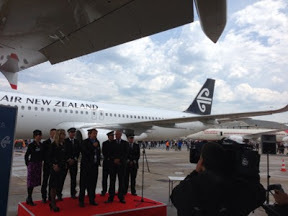 James and the NZ team were all to go with it on Saturday to Paris for the official handover. Unfortunately things did not go as planned with the aircraft and early on in the week there were issues. Eventually after some very long hours the problem was fixed at 7.30pm Friday night. So James had a very quick dinner and headed back to work to sign off the aircraft and do all the final paper work. He eventually got home at 2am only to get up at 7am the next morning, pack and head to the airport. 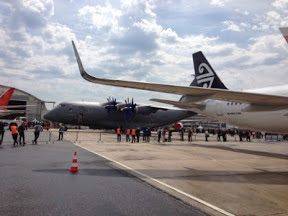 In the end it was all worth it and the airshow went well and the Air NZ A320 had lots of interest shown in it. James' plane looking smart with the sharklets! Meanwhile back in Toulouse Mum and I continued our sightseeing tourof the local sights. 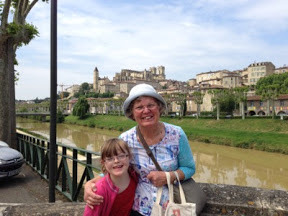 Last Tuesday was a beautiful day and as Hannah didn't have school we decided to head west to Auch. 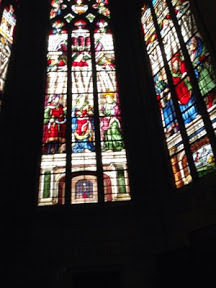 I had not been before but had heard that it had a great Cathedral (don't all French villages!). It is known for the musketeers so Hannah was hooked - although she prefers Barbie and the Three musketeers. The approach into Auch was lovely as we drove through a valley, terrocota coloured French villas and then saw the cathedral on a hill. 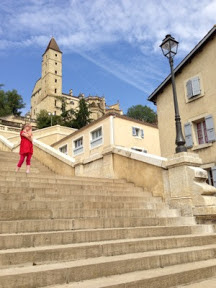 Auch is very provisional with no ugly modern flats on the outskirts of the town to spoil the view. We found a park and as this was the first time I had used a meter in France (normally use car park buildings) was very surprised when I put in 2 euros and it gave me 4 hours! I then realised that it did not charge me for lunch time. Even the car park meters get a two hour lunch break in France. 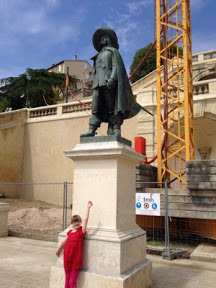 We then headed along the river and walked up the monumental staircase which has a statue of the fictional muskateer d'Artagnan. It was a very grand staircase and they are currently restoring the steps and the fountains so excuse the cranes! It will look lovely when it is finished. 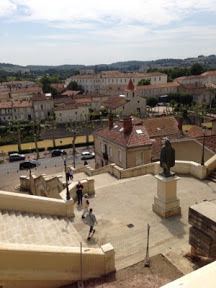 One of the things I have noticed about France is that they are very good at looking after their historical sights and are prepared to spend the money in order to keep monuments and public spaces looking great. We were starting to get hungry and as the cathedral was closed for lunch we decided to find a cafe. After wandering the alleyways we eventually came upon an Irish pub with a lovely deck and outside seating area. Even though it was an Irish pub it still served French fare! 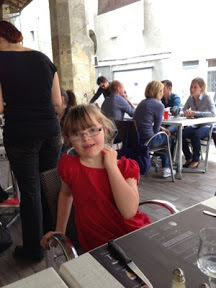 Hannah had her traditional steak hache and chips with a coke and mum and I had a flan each. Love the flans here as they are as big as a dinner plate - yum! We finished lunch then headed to the cathedral. It had a beautiful choir room and Hannah had a great time taking photos! On Thursday night Penelope and her singing group had her concert. 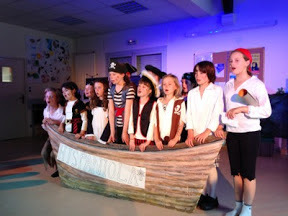 It was great to see the children preform and listen to their gorgeous voices. 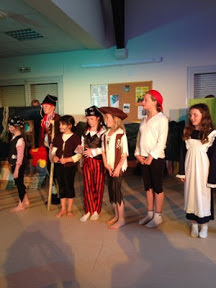 We were very proud of our wee Penelope - what a great Billy Bones she was! She did especially well in the dying scene. On Friday IST had a global awareness day so the kids headed to school in dress up. 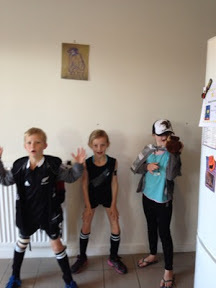 Jasper went as an all black, Penelope was a black fern and Hannah was dressed in clothes from NZ. 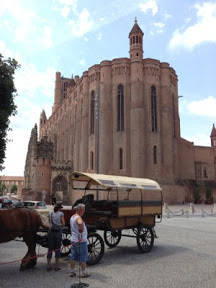 For Saturday the plan was to head to Albi and yah the sun was shining. We got there nice and early, found a park (again the parking meters had a lunch break!) 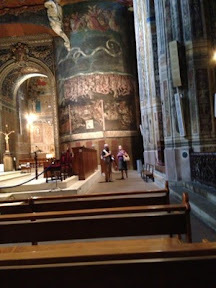 and headed for the cathedral. 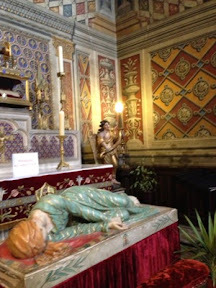 Albi cathedral is beautiful and one of my favourites. It is huge but quite plain from the outside and then inside every surface is painted - even the floor. 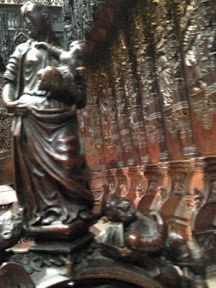 We went up to the treasure room and looked at the gorgeous historical treasures. Hannah once again got hold of my phone and took lots of lovely photos. 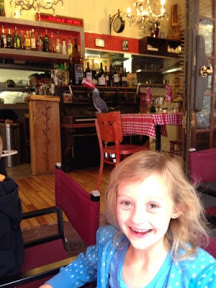 We found a great cafe for lunch which had a cheeky, loud parrot in residence who loved to drink coke - Hannah's sort of bird! 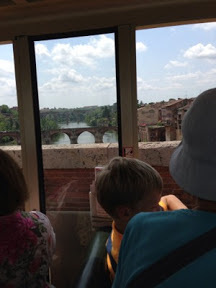 We decided to jump on the little train that drives around Albi to have a look at the sites rather then walk - the kids were pleased about that.